Fire Emblem: Mystery of the Emblem is the third entry in the Fire Emblem series, released only in Japan on the Super Famicom in 1993. It is comprised of both a compressed remake of Fire Emblem: Shadow Dragon and the Blade of Light (Book 1) and a new sequel (Book 2), giving players the option to skip to the sequel if they're already familiar with the original game. In the sequel, several years after the fall of Medeus, Marth is dispatched by Emperor Hardin of Archanea to deal with an uprising in Grust, but is appalled to find his "allies" are instead brutally oppressing the citizens. Marth gathers a liberation army to fight back against the now corrupt Archanean Empire. As he fights through his new enemies, Marth slowly learns more about Archanea's Fire Emblem and the lore behind it, hence the title "Mystery of the Emblem". Just like how Shadow Dragon and the Blade of Light received a remake for the Nintendo DS (Shadow Dragon), Mystery of the Emblem got its own remake — New Mystery of the Emblem, Heroes of Light and Shadow. 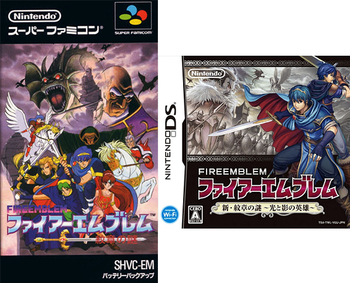 Released in 2010, it only covers Book 2 of Mystery of the Emblem and, unlike Shadow Dragon, did not leave Japan. It is far less of a direct redo than its predecessor; it reincorporates characters left out of the original Mystery of the Emblem, introduces those from the Satellaview chapters and Shadow Dragon, alters the story slightly and implements a completely new subplot, and includes a player-created character (a feature which would be carried over to the next two entries in the series, Awakening and Fates). It includes remakes of the four BS Fire Emblem chapters as bonus content, as well as all-new bonus chapters as downloadable content. Mystery of the Emblem is followed by Fire Emblem: Genealogy of the Holy War, which takes place on the continent of Jugdral many years before the events of Marth's stories. New Mystery of the Emblem is followed by the Nintendo 3DS game Fire Emblem Awakening, which takes place in Archanea 2,000 years in the future. Adapted Out: Wrys, Darros, Roger, Jake and Beck are removed from Book 1. As such they missed out on appearing in Book 2 as well. Bag of Spilling: With the exception of some late-joiners and turncoats, units who can potentially Class Change in the War of Shadows reverted back to their base class and lower levels in the War of Heroes. Brainwashed and Crazy: Hardin becomes corrupted thanks to the negative influence of Gharnef's Darksphere, which twists him into becoming evil. Darker and Edgier: Mystery of the Emblem has more political intrigue, character deaths, and darker lighting than Shadow Dragon and the Blade of Light. Things have gotten much worse for Archanea in general after the Time Skip due to the influence of its corrupted emperor. Doorstopper: Mystery of the Emblem has two full campaigns (a remake of the first Fire Emblem and a completely new story), making it a very long game by the standards of the time of its release and the SNES. Embedded Precursor: Book 1 is an abridged remake of Shadow Dragon and the Blade of Light, the first Fire Emblem game. FaceHeel Turn: Formerly the helpless fallen kingdom that Marth must help saving, Archanea as a whole turns into The Empire after its emperor got influenced by the Darksphere. Kryptonite-Proof Suit: The Iote's Shield is an item that negates weapon effectiveness against its wielder. Later incarnations of this item would restrict its effects to fliers. Nostalgia Level: A number of levels from Book 2 are ripped from the first game, Shadow Dragon and the Blade of Light. Chapter 8 takes place on the Chiasmir bridge where Marth's army fought the Sable Knights (this level was not present in Mystery of the Emblem Book 1). Chapter 9 takes place in the Khadein desert where Gharnef first appeared. Chapters 15 and 16 involve Marth liberating Altea again. Chapter 17 takes place at the Gra Bastion where Marth faced Jiol. Chapter 19 takes place in the pass of Archanea outside of the palace. Chapter 20 takes place inside the palace of Archanea, where Midia is held as a hostage again. Nintendo Hard: Book 2 has much harder chapters than Book 1, with many do or die moments and puzzling chapters. Official Couple: Marth and Caeda, the first of several instances of the main Lord having a canon partner. They are engaged at the end of Shadow Dragon, and it's because of this war that they have to hold off their wedding - not that Caeda minds, especially since she joins the front lines with him again anyway. There are also a bunch of others: Julian and Lena, Samson and Sheena, Merric and Elice, Abel and Est, and ultimately Camus and Tatiana, as he ultimately decides to return to Valentia instead of staying with Nyna. Abel and Est's marriage also ends badly on several levels: not only is Palla still pining for him, but Est is so riddled with guilt over being repeatedly kidnapped that she abandons both her husband and possibly Archanea altogether, with Abel also throwing away everything to try and find her. Put on a Bus: Several characters who appear in Book 1 fail to appear in Book 2 with no story reasons; namely Barst, Bord, Cord, Caesar, Radd, Dolph, Macellan, and Tomas. Redemption Equals Death: Having been nursed back to health by his sister and not quite killed by the other after apparently dying in Shadow Dragon and the Blade of Light/Mystery of the Emblem Book 1/Shadow Dragon, Michalis (formerly someone evil enough to kill his own father) dies stealing Starlight from Gharnef to give to Marth's group in Mystery of the Emblem Book 2/New Mystery of the Emblem. Lorenz dies at the end of Chapter 1, which is his only appearance in the whole game. Boah is strongly implied to have died in his brief appearance in Chapter 19. Hardin as the major villain of this game has to be put down by Marth's army. Time Skip: The events of the game happen two years after Shadow Dragon and the Blade of Light. Vendor Trash: In Book 2, you can obtain three Silver Axes over the course of the whole campaign; however, there are NO units that can actually equip them note Darros is completely Adapted Out, while Barst, Bord and Cord are Book 1-exclusives, thus rendering them little more than free gold. You Monster! : Played for Laughs with minor boss Dahl, who calls Marth a monster for stealing the stolen goods from his gang of thieves. Adaptation Expansion: The remakes includes a number of new chapters, incorporates characters introduced in Shadow Dragon, expanding some already existing plot points and characters, and includes a new subplot about an assassination attempt against Marth. A number of Support conversations involving the Avatar allude to major events that took place in Shadow Dragon and BS Fire Emblem. In their first support, Est showed Minerva a replica of the Angel Ring, an item exclusive to Fire Emblem Gaiden and mentioned how she and her sisters traveled beyond the sea prior to the War of Heroes. The Whitewings appeared in that game where Palla and Catria had to rescue Est from Valentian pirates and got involved with the war there. Character Customization: The new main character is actually a creation of the player, built from a selection of designs and attributes. They can get new options as they progress through the story, such as a haircut by Wrys or a replica of Tiki's tiara from Xane to name a few. Continuity Snarl: Accessing sidequests in Shadow Dragon requires purposefully killing off your characters, but everyone returns alive and well for New Mystery of the Emblem. Despite this, Marth recognizes most of the sidequest-only characters outside of Nagi (as that requires Tiki's death among other things). Developers' Foresight: In Chapter 3x, Clarisse is programmed to retreat when your characters get too close to her position. If you somehow manage to get in there and attack her, her battle quote indicates surprise at how quickly you managed to get the drop on her. Discontinuity Nod: In the prologue, Marth has a long conversation with the Avatar about how deeply the deaths of comrades during the last war affect him, and how while some people believe in the importance of "sacrificing the few to save the many", Marth would have none of that, and aims to save everyone under his command. It's likely this is a deliberate jab at Shadow Dragon's controversial sidequest requirements. While its predecessor rewarded you with sidequests for killing off your characters, this game openly scolds you for the same behavior. Embedded Precursor: The game contains a remake of the four BS Fire Emblem maps as unlockable content. Evil vs. Evil: The Assassins DLC Chapter is focused on the assassin group from the main campaign (Katarina/Reese, Clarisse, and Legion) driving out the Soothsires (the bandit group from the previous game) in order to "rescue"* presumably to convert into Child Soldiers the children kidnapped by said bandit group. First-Episode Spoiler: At the very end of the prologue, Katarina, who was introduced as a companion Altean recruit, reveals her true self as an assassin aiming to kill Marth. This is how we are introduced to the assassination sub-plot added in the remake. Glass Weapon: There are glass staffs, swords, lances, axes, and bows that break after three uses. They're as strong as Silver weapons, but don't require the high weapon rank to use them that Silver weapons do. Guide Dang It! : Recruiting Michalis in Chapter 21 becomes more complicated than necessary. Instead of visiting the village with Minerva (impossible since only Marth could do that), she must stand on the village's entrance before Turn 15, where it triggers a conversation between her and Michalis. Marth must visit him on the next turn to obtain Starlight. Only after the end of the chapter then he will survive and could be recruited. Without all that, Michalis will die like in the original Mystery. Joke Item: You can obtain items like frying pans and use them as weapons. Leaning on the Fourth Wall: In Nagi's support with the Avatar, she reveals she has some sort of divination ability and notes that they are "an enigma" "guided by a mysterious fate", while the Avatar notes they have felt someone's guidance. Loads and Loads of Characters: The game brings back characters from Shadow Dragon who never appeared in the original Mystery of the Emblem (including the SD-exclusive characters) and even adds the characters who only appeared in the BS Fire Emblem episodes. Player controlled units in the main game alone add up to 77, the largest playable cast of the entire series (just edging out Fire Emblem: Radiant Dawn at 73). MayflyDecember Friendship: The long-living manaketes Gotoh, Xane, Bantu, and Tiki all befriend Marth. They all outlive him. In a conversation with Xane, he mentions this as a reason why he has trouble connecting with humans. Mood Whiplash: Xane's third Support conversation with the Avatar starts with him pretending to be Jagen and declaring his love for them, but then discussing how he no longer fits in with humans or dragons, and how cynical he's become due to living so long. Javelins went from a respectable 7 Might in Shadow Dragon to a less impressive 3. Wolf and Sedgar's stat growth rate are lower than in Shadow Dragon. While Tiki can still wield multiple Dragonstones like in the original Mystery of the Emblem, and they're just as potent as they are in that game, she no longer takes on a dragon form when using them. In Mystery, the transformation lasts several turns, grants Tiki flight, and she has unlimited "breath" attacks during her transformation, prolonging the stones' uses in combat. The stones in New Mystery, on the other hand, function like they do in The Binding Blade and in The Sacred Stones, in which she transforms for a single attack and depletes one of its uses. Not Quite Dead: The sacrifice that was Left for Dead in Shadow Dragon's prologue (revealed to canonically be Frey when he shows up in the tutorial) actually got out alive. Ominous Pipe Organ: The final chapter has an accompanying organ piece titled "Forbidden Sanctuary" that the original didn't have. Redemption Earns Life: It is possible to keep Michalis alive in New Mystery by sending Minerva over to the village he's staying at. If you do so, he fights alongside Marth for the rest of the war and leaves to become a king on another continent in his ending. Ret-Canon: The game properly introduces a lot of bits that were originally just Word of God backgrounds to the story proper. For example, a conversation between the Avatar and Ogma brings up Ogma's fighting style being based on gladiatorial fighting. Send in the Clones: Legion endlessly sends out clones until the real one is defeated. Spared by the Adaptation: The remake allows you to avoid a number of character deaths from the original, such as Michalis and the Wolfguard. Vendor Trash: Because axe-users are now present in the remake, the Guide Dang It! instance of the three Silver Axes being sold off strictly for free money no longer applies. Gold bullion items now take up this role. Villain Episode: The Assassins DLC focuses on the assassins from the new subplot added in the remake and the player is given control of Katarina/Reese, Clarisse, several Legion as well as Eremiya and even Gharnef.